and SVMi-8 captures the caller ID and saves it in your voice mailbox with each message. Then you can call back the person leaving the message. You can answer any or all lines immediately or answer only the calls that your operator does no pick up. You will be able to navigate through the SVMI-4 and SVMi-8 menus using the keyset display and the soft keys below the display to respond to the prompts. You can add or record some prompts to suit your particular business. The SVMI-4 and SVMi-8 clock is responsible for providing each message with a date and time stamp. Changing between day and night modes is always synchronized with the phone system. SVMI-4 is Samsung's newest voicemail product. Built with the reliabilty and features found in larger systems, the SVMI-4 is specifically designed to function with DCS Compact and DCS 50si. With 4 ports, 32 mailboxes and a full auto attendant, the SVMI-4 brings a higher level of professionalism to your business. The SVMI-4 comes equipped with 2 ports and capability for 16 mailboxes, and it can be easily upgraded to 4 ports and 32 mailboxes using an upgrade key. 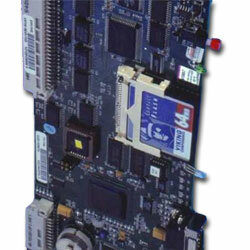 The DCS Compact supports either the 2 port SVMI-4 or the 4 port SVMI-4 card. The DCS50si supports only the SVMI-4. The SVMI-4 has no moving parts. The memory capacity is almost 5 hours, and is stored on a 64Mb Compact Flash module. The installation of the SVMI-4 is extremely simple. Extension and mailbox information is automatically downloaded upon power up, and the system will operate as soon as it is turned on. Thus making the SVMI-4 an ideal choice for any growing business. The SVMi-8 is a self contained plug in voice mail/auto attendant card for the DCS, iDCS 500 and DCS 50si. Designed to meet the demands of the sophisticated voice mail user without sacrificing simplicity. It may act as an Auto Attendant system only, a Voice mail system only or both. Out of the box the SVMi-8 can handle 4 calls simultaneously, and it can be easily upgraded to handle up to 8 calls simultaneously. No external line or power connections are necessary, these are accomplished directly through the phone system. The SVMi-8's modular design allows it to be expanded to add voice ports as needed. Because the SVMi-8 is able to handle up to 8 lines you'll never miss an important message again. The SVMi-8 provides full integration capabilities and features unlike any other voicemail system in the market today.